Blog / Events / December in Florence and Tuscany – Lots to do! 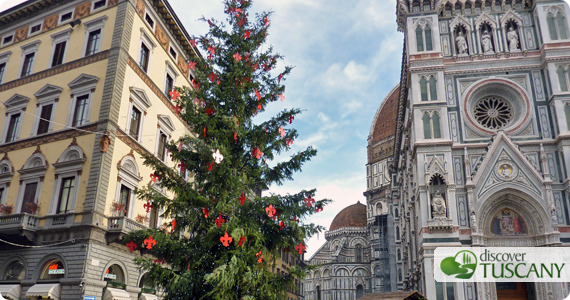 December in Florence and Tuscany – Lots to do! The month of December in Florence is filled with holiday shopping, hot chocolate and holiday cheer, making it a very fun month to be in Florence and Tuscany in general even if the temps are going down. There are many events to look forward this month, so take note of the following! German Christmas Market – Piazza Santa Croce, from November 28 – December 16. The largest Christmas market in Florence where you can buy beautiful handmade gifts, enjoy many traditional snacks and mulled wine ( vin brulee). Very packed on the weekends, so if you can, visit during the week. Santa Maria Novella Christmas Market – Piazza Santa Maria Novella, from December 10-22. Another Christmas market in Florence, lesser known, is the one in the Santa Maria Novella square which also offers traditional Tuscan/Italian specialties, wine and handmade products perfect for gift giving this holiday season. We recently wrote an entire post about Christmas markets and nativity scenes in Florence and all over Tuscany, read our post here. The lighting of the main Christmas Tree in Florence in Piazza Duomo on December 8 at 5pm – don’t miss it if you’re in town! Christmas Concert – On December 15 at 3:30pm, if you have children between 3 and 15 years old, we suggest heading to the Church of Ognissanti to listen to the musical concert put on especially for them by the Centro Musicale Suzuki. Gregorian Chants of the Christmas Season – Church of Santa Croce, December 22, 9pm. A special Christmas time treat is to go listen to the concert of the choir of the Santa Croce church Coro Viri Galilei singing their Gregorian holiday chants. For more info, see their website here. Firenze Winter Park – right next to the OBI Hall, Lungarno Aldo Moro. Open every day from December 7 through January 27, 2013. For the first time this year, an outdoor artificial winter park is being set up right along the Arno river complete with skiing and ice skating so you don’t need to drive long hours to enjoy some outdoor winter fun! There will be food and crafts stands as well as entertainment for children to make the whole area a pleasurable place to enjoy a day out, it is definitely something to check out! If you’re here between December 20-23, you may even see “babbo natale” or Santa Claus on skis. The official brochure is here. Aperitivo ad Arte at Palazzo Davanzati. Via Porta Rossa, 13 Every Friday at 7pm until February 2013. The initiative started this summer at the Uffizi, then continued on at the Bargello and now has moved to Palazzo Davanzati, a beautiful medieval house museum, that allows you to visit the palace after hours while sipping a great glass of wine or another aperitif. Definitely one of the lesser known museums in Florence, but beautiful! If you needed an excuse to go and see it, this is it! Reservations are required – call 055/294883. Natale per FILE – at Palazzo Corsini, Lungarno Corsini 8. December 7 – 9, from 10am – 7pm. Traditional Christmas market held in a beautiful Renaissance palace where you can expect all sorts of goods, from clothes to the famous Italian christmas cake “panettone”. All proceeds go to FILE, the association dedicated to providing assistance to cancer patients and their families. You can read more about it here. Christmas at Palazzo Strozzi – Piazza Strozzi. A special day on December 8, 2012 from 3-6pm. A day dedicated to families – inside the inner courtyard, children and adults can enjoy special activities together to have fun. 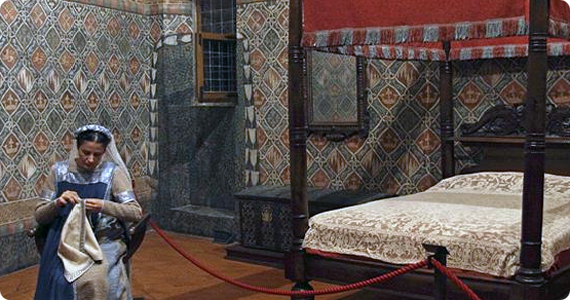 Activities in courtyard are free, museum tickets offered at special prices. More info here. 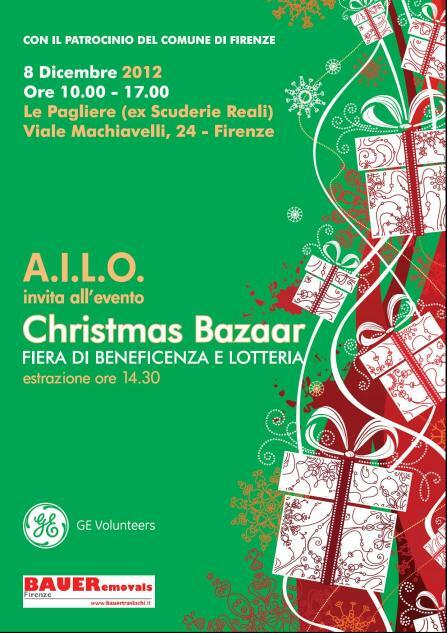 Christmas Bazaar by AILO (American International League of Florence) – at Le Pagliere, viale Machiavelli 28. Only one day, December 8, 10am-5pm. This organization holds their annual Christmas bazaar to raise proceeds for local charities. Lottery with great prices donated by local businesses and entertainment for kids, as well as burgers and hot dogs during lunchtime (all proceeds also going to charity). Finally, if you plan to be here at the end of the month for New Year’s Eve, just know that musical concerts are planned in various of the major piazzas in the city as has come to be a tradition over the last few years. We will post more details as soon as we know more about what the city plans for welcoming in 2013! Ice Skating at the Outlets Not just shopping at the outlets in Barberino di Mugello this Christmas. An ice-skating rink has been set up for shoppers and their families to enjoy for FREE! 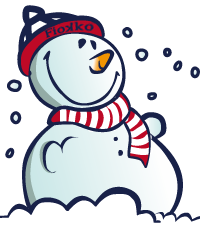 The rink will run from now until January 6! A very good incentive to head to Mugello this month for at least some of your Christmas shopping! Visit “Babbo Natale” (Santa Clause) in Montecatini Terme. At the Castello delle Terme Tamerici, between Via delle Terme and Via Fedeli, in the heart of the town). Enjoy a “Christmas village” where you can visit the big man himself, chat with his helper elves, send your Christmas letters and play with salt dough to make ornaments. Running on the weekends of December 7-9 and December 14-16 then from December 21 through January 6, from 10am to 9pm. More details here. CastelNatale – in Castelnuovo Garfagnana, December 21-23. If you’re spending Christmas in the Apuan Alps or nearby, head to Castelnuovo to enjoy the holiday season with shopping and entertainment for the kids, including a visit with Santa. You can learn more on their Facebook page here.